Helsinki Fashion Week is the world’s first 100% sustainable fashion festival. Not only are the brands presented sustainable and ethical, but so is the location, the buildings, and the whole concept around HFW. 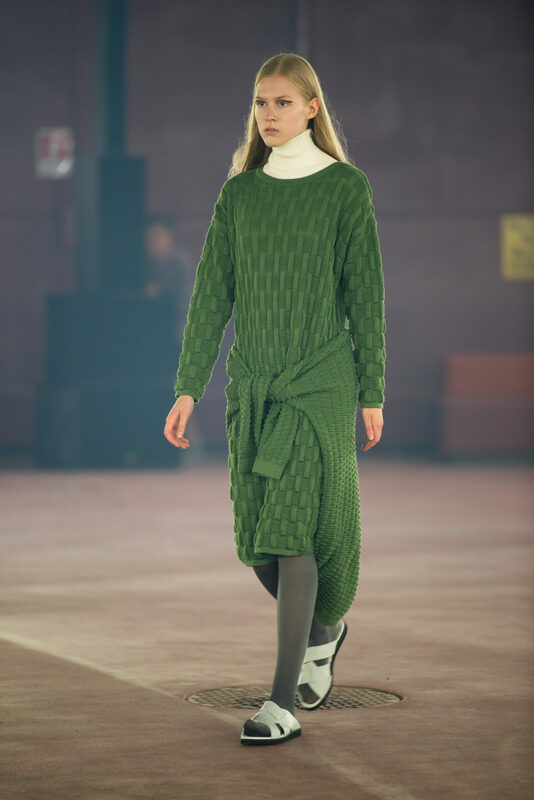 As the leading figure in sustainable fashion, Liisa Soolepp with her knitwear was invited to walk the first walk of the fashion week. Since TOKU shoes were complementing Liisa Soolepp’s looks, we digged in deeper to talk to Liisa and to share her thoughts with our readers. Liisa, tell us your story – why did you become a designer? I quite like the phrase “creative DNA”. I believe that all the vital and important decisions we make and turns we take are coded in our creative DNAs. It is there – sitting – until the right opportunity comes. Knitting has been in my life since I was a child. Both my grandmother and my mother were quite swift in knitting. During those days, the only kind of yarn that was available, was coarse wool – the kind of wool, that would make your skin scratch. But I remember that day when my mother received a gift from her colleague in Sweden. It was bags full of exclusive wool – the silky and fluffy kind of wool, that you just want to rub against your cheeks! This turned my archaic-traditional experience with wool upside down. That kind of contrasts – rough and luxurious – still fascinate me and I try to find ways to express those feelings in the work I create today. Have you always wanted to build a sustainable fashion brand? For me, this has rather been a process and my brand has developed to what it is now. I first put my work to motion and only then started to perceive which way I want to steer. I got a full picture of where I want to go, when I got to know better the background of the field. 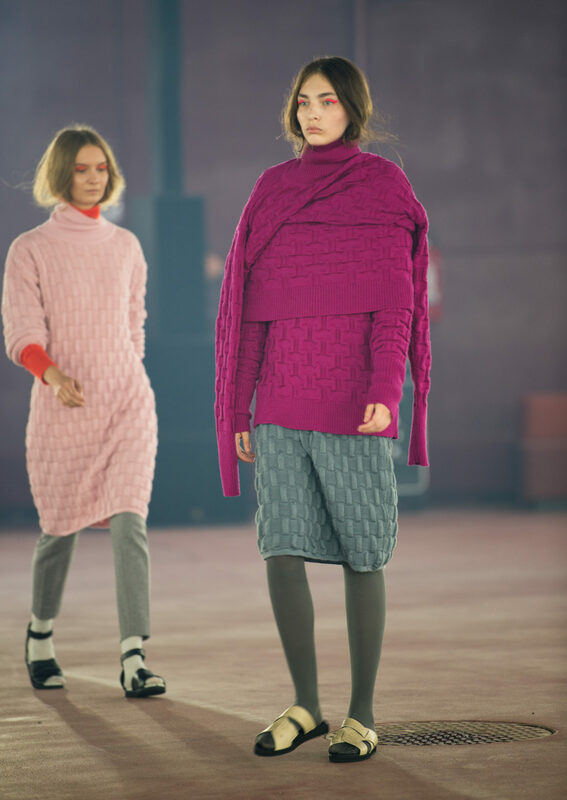 What was the most inspiring thing you saw at Helsinki Fashion Week? The area and place HFW took place. It was an old oil container – Säiliö 468 -, that has been rebuilt and turned into a really cool location. Already the journey to the location was special and gave a nice setup and tuning for the whole week. When I created the collection, I was inspired by the relationship between chaos and order. When I was standing in the backstage, just before the show – no coffee in my bloodstream – I felt, that this is the closest I’ve been to chaos. But when the show started, it went as smoothly as possible – in total order. Helsinki Fashion Week is the first 100% sustainable fashion show. Do you think HFW will start a revolution? Or is the revolution already here? I think changes in the fashion industry have been in the air for a while now. It is only natural, that slow fashion is now explicitly showcased – it deserves to be. About styling. Where did you get the idea of using TOKU shoes for styling? The idea to use TOKU shoes emerged when talking to our stylist Liis Plato. At first we had a totally different vision, but when putting the looks together, we realized that we need something totally different – something airy and light. TOKU shoes – with a slight Japanese vibe – and my collection were a match made in heaven. It was easy to combine TOKU shoes with different kinds of socks and stockings, and it was easy to create different kind of looks. Where and when did you first hear about TOKU shoes? What did you think? I quite randomly saw TOKU shoes at Kaubamaja department store. They immediately caught my eye and impressed with their simple and elegant look. When I found out that they were designed and made in my home country – Estonia – I was pleasantly surprised. Any comments on Liisa Soolep + TOKU look?